VINTAGE RECIPE: My Great Aunt Ellen’s Chicken and Dumplings- MY NEW VERSION- Now w/saffron and truffle oil!! I added a new, modern twist to this recipe- a pinch of saffron and extra garlic in the chicken cooking water- and truffle oil to finish the thing off, to taste. After I finished writing the last blog post, I started on the chicken and dumplings. right away I could tell that 2 tsp baking powder in one cup of flour was WAY too much- also, most recipes call for some form of fat, which I added. Aunt Ellen used ‘chicken cooking water’ and canned broth. 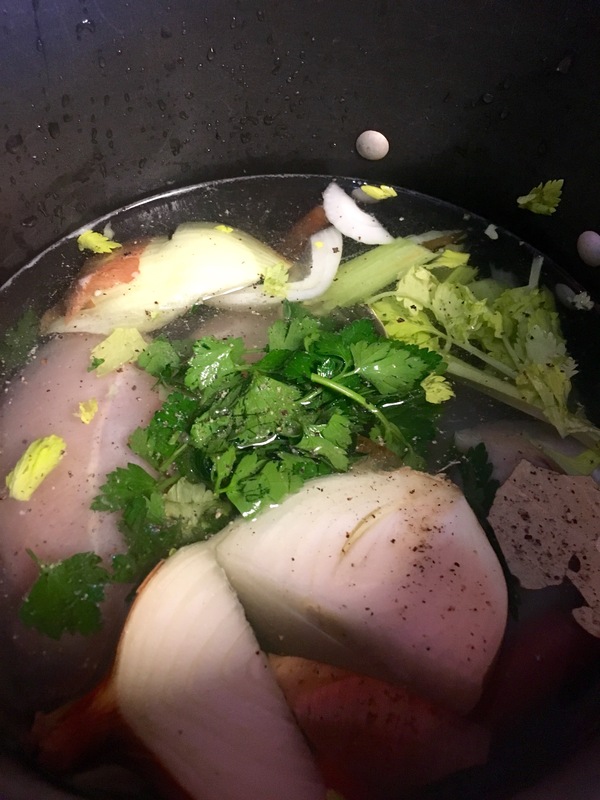 I decided to kill two birds with one stone and make my OWN broth. UNPEELED onion, cut in quarters.